En-suite rooms with hairdryer, trouser press, high-speed internet access, a 21-inch TV, a radio alarm, desk, telephone and tea and coffee-making facilities. Smoking rooms available on request. 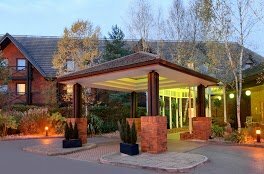 The hotel has lifts to all floors, so all rooms are accessible to disabled guests, however, two rooms on the ground floor have been specially adapted for disabled guests. One of them has a lowered bath, and the other has a walk-in shower. They also have grab rails and alarm cords. You will need to take a taxi to the airport. A taxi to the airport is about £9. Contemporary à la carte cuisine served in the Restaurant at the Hilton Southampton hotel. This restaurant has a raised terrace area with views of the gardens. Pavillion bar and lounge. Room service available 24 hours. Caffe Cino serves sandwiches, continental snacks, coffee and speciality teas from 8am to 4pm seven days a week. Guests enjoy free access to the LivingWell Health Club located at the Hilton Southampton hotel. Keep fit with cardiovascular equipment and weights or try an aquacise class in the 13-metre indoor pool. De-stress in the sauna or steam room, open from 7am to 10pm on weekdays, and 8am to 9pm at weekends. There is a charge for treatments in the beauty salon. Sat Nav location details are unreliable for this hotel. Leave the motorway at junction 14 and take the A33. You will pass the hotel on your left. At the Chilworth roundabout take the third exit, just past the garage, and go back the way you have come. Take the slip road on your left and bear right over the flyover into the hotel entrance. Leave the motorway at junction 5 and take the A335 towards Southampton. Turn right at the traffic lights into Bassett Green Road. At the Chilworth roundabout take the second exit, just past the garage. Take the slip road on your left and bear right over the flyover into the hotel entrance. Take the A33 northbound to the Chilworth roundabout. Take the first exit, just past the garage, then take the slip road on your left and bear right over the flyover into the hotel entrance. You can get a train to Southampton Airport Parkway station, and then a taxi to the hotel, which will cost about £9.